Researchers at the Masdar Institute of Science and Technology in Abu Dhabi have developed an inexpensive glass coating technique that reduces solar heat gain nearly as much as more expensive techniques currently used on low-emissivity glass. Air conditioning accounts for about 75% of Abu Dhabi’s peak daily electricity usage, so reducing demand for air conditioning is critical, especially in modern all-glass buildings. Low-emissivity glass is a standard material, but it is expensive. Typically, low-emissivity glass is coated multiple times using thin silver films and other materials. The layers are applied using a vapor deposition technique, which is relatively slow and expensive. In addition, depending upon the materials in the deposition layers, low emissivity coatings can reduce the transmissibility of visible light, and can change the appearance of the glass by giving it a red or brown cast. The Masdar Institute glass coating technique is significant because it reduces the cost of manufacturing low-e glass. The technique still uses vapor deposition to apply the coating, but the coating itself has been changed. The team used an inexpensive metal-oxide layer that is nearly as effective in blocking light waves from the non-visible spectrum. Unlike traditional silver-based coatings, the metal-oxide coating is applied only once. This shortens the production time without significantly sacrificing performance. Reducing the number of times a coating must be applied, and using less expensive materials that are nearly as effective, reduces the cost of production and acquisition. It also preserves the clear/neutral appearance of glass, which makes it a desirable option for new construction. The coating material is still be refined and tested. To date, the team has worked with small-scale glass coatings, but the next step is to verify that the coatings perform similarly on larger pieces of glass. The glass coating will then undergo more rigorous performance tests to ensure that it is durable enough to perform in harsh climates. If you’re looking for some inspiration for your next glass project, please visit the rest of our site. If you’d like to purchase Glassprimer™ glass paint, please visit our online store . Solar energy is moving to the forefront of the clean energy movement and photovoltaic glass may help bring the technology to more densely populated (and less sunny) areas. Until recently, the state of the solar energy industry was limited by the available collection technology. Solar energy was (and still is) most likely to be successful in areas that receive a lot of direct sunlight throughout the day. That tends to leave out regions like the Northeast, the Great Lakes and the Northwest, which are often under cloud cover. In these parts, solar energy is a passive, supplemental power source, and offers limited benefits. One way to increase the amount of solar energy collected is to increase the size of the solar collector. In sparsely populated areas, large arrays can be constructed on the ground. This approach is not practical in urban areas, where the population is more densely concentrated. Unfortunately, to make the glass dark enough to harvest this type of solar radiation meant that the glass was too dark to transmit the visible light. This meant that the glass could not be used in windows and in other applications, where transparency is desirable. New developments in photovoltaic glass include the development of glass that can absorb the invisible light spectrum and direct it toward the edges of the pane, where it can be converted to electricity. This material permits the transmission of visible light, so it can transform any window or glass surface into a solar energy collector. The material is currently about 20% transparent, which is still relatively dark. Further advances, however, could increase the transparency of this glass, and make photovoltaic glass practical for other applications. In the meantime, another approach to reducing energy costs through glass is to block UV radiation from entering buildings. Glassprimer™ glass paint is specially formulated to bond permanently with glass. The paint is available in any color, and resists peeling, chipping and fading, even in direct sunlight. Reducing solar gain through selective obstruction can reduce energy costs year-round. Glass and electricity typically don’t mix. so much so that glass is often used as an insulator. New research into electricity and molten glass may change the way that glass is made. The surprising discovery, made in part by researchers at Lehigh University, shows that an electrical current applied to heated glass can cause the glass to melt at lower temperatures. By itself, this has implications for glass fabrication. By reducing the melting point of glass, less energy is required during the heating or reheating stage of glass production or glass recycling. Since glass is usually processed at extremely high temperatures, the notion of reducing energy is welcome. Beyond reducing the melting temperature of glass, the researchers – working with another research team at the University of Marburg in Germany – discovered that heated glass can be precisely melted at specific points using direct electrical current. The discovery means that glass could be precisely shaped following molding and cooling. The Marburg researchers had also been working with glass and electricity, and discovered that it was possible to leave an electrical charge on glass, which is normally electrically neutral. Charged glass potentially has some desirable optical and bioactive properties. The combined research team worked together to understand the exact mechanisms that describe their laboratory findings. The team’s findings will be published in the September 2016 issue of the Journal of Electrochemical Society. With a more complete understanding of the mechanisms at work, the team can now focus on fine-tuning applications for their thermal and electric manipulations of glass in manufacturing. In the meantime, if you’re looking for some decorative inspiration involving glass, please visit the rest of our site. Glassprimer™ glass paint is an exceptional, specially engineered paint product designed specifically for glass surfaces. If you’d like to purchase Glassprimer™ glass paint, please visit our online store . The Reichstag building in Berlin features the Reichstag Dome, an iconic glass addition to the building that houses the Bundestag, the German Parliament. The Reichstag building in Berlin was originally constructed in 1894 to address the need for a larger building to house the Parliament. The original building featured a large dome. The building was largely destroyed in 1933, the result of a suspicious fire that was blamed on Communist supporters. There was no actual evidence to suggest the true origin of the fire, or even that the fire was deliberate. Allied bombings of Berlin during World War II destroyed the remainder of the building. The Soviets partially rebuilt the building as a conference center in the 1960’s, during their occupation of the city. The dome, which had been an integral part of the original design, however, was not part of the reconstruction. Meanwhile, the western capital relocated to Bonn. With the reunification of Germany, Berlin again became the country’s capital city. The Parliament decided to rebuild the Reichgstag dome, using the Soviet’s initial reconstruction as a starting point. The government sponsored a design contest to rebuild the dome over the Parliament building in 1993. Norman Foster, a British architect, won the contest and was commissioned to rebuild the Reichstag Dome. Foster’s original design was rejected on the basis of cost, and eventually, he designed the glass dome, incorporating spiral staircases originally proposed by another architect. The design allows the public to ascend to top of the dome, and see down into the Parliamentary chambers. The design supports the broader idea that the government serves its people. The glass in the dome relies on a series of mirrors to reflect sunlight into the dome without increasing the temperature in the building. A specially designed shade tracks the movement of the sun to block direct sunlight throughout the day. The dome actually increases the energy efficiency of the building. When it was first introduced, the glass dome was controversial. 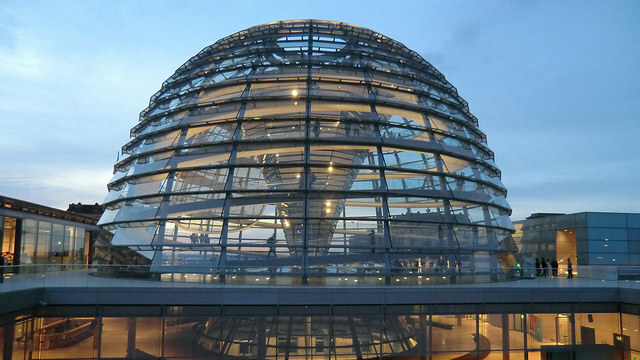 The glass dome provides a 360° view of both the activities in the Bundestag, and the City of Berlin. The dome is open to the public from 8:00 AM to midnight daily and has become a very popular and inspirational tourist attraction. If you’re looking for some glass inspiration of your own, please visit the rest of our site. If you’d like to purchase Glassprimer™ glass paint, please visit our online store . Recently, scientists at the University of Maryland demonstrated transparent wood. The wood has been chemically treated and stripped of a colored compound called lignin, then filled with a transparent epoxy to give it strength. The epoxy-treated wood is about five times stronger than natural wood. The researchers have been working with larger blocks of treated linden wood and have discovered that while the wood transmits only slightly less light than conventional glass, it offers surprisingly good UV resistance. The wood transmits significantly less heat than standard glass, meaning that it could offer superior energy efficiency. The research team constructed a tiny house, using a transparent wood panel in the structure’s ceiling. The panel transmitted light evenly around the structure, but did not permit any significant buildup of heat, as would be expected with traditional glass. Because the transparent wood channels light in a different way, the distribution of light stays constant, even as the angle of the sun changes during the day. In addition to offering UV resistance, the transparent wood is not prone to shattering. The transparency of the wood changes depending upon how the wood is cut. The researchers have focused their efforts on wood that has been cut against the grain, since it offers the best light control. Transparent wood has a slight haze to it, so it is not perfectly clear. The wood “glass” allows light transmission, but offers some privacy. The transparency of the glass could be modified by changing the angle of the cut, relative to the wood’s natural grain. Controlling UV radiation is critical to improving energy efficiency and the overall comfort of an interior space. While there’s no way to know if or when transparent wood will be marketed, you can use other strategies to minimize solar heat gain through glass. Glassprimer™ glass paint offers exceptional UV resistance, while delivering customized color that lasts. Guaranteed for 10 years when used on interior applications and applied according to manufacturer specifications, Glassprimer™ glass paint will not delaminate, chip or fade, even in direct sunlight and high humidity. That’s because Glassprimer™ glass paint makes a permanent bond with the surface of the glass – something that other paints don’t do. If you’d like more information about working with Glassprimer™ glass paint, please visit the rest of our site. If you’d like to purchase Glassprimer™ glass paint, please visit our online store . If you’re a Manchester City soccer fan, you may be able to get a closer look at your favorite players, thanks to a new glass tunnel being constructed as part of a renovation at the club’s home Etihad Stadium. The renovation designs are largely finished, and the construction will take place between seasons. The new glass tunnel will debut at the start of the 2017-18 Premier League season. Man City fans will be able to see not only their hometown heroes, but also the visiting team. That prospect may not sit well with visitors, some of whom already complain about television cameras in the tunnel before and after the game, and between halves. The strategy works for the Dallas Cowboys and will work for Manchester City. That’s because the teams depend upon forging a close relationship between their fans and the players. Giving fans access, including behind-the-scenes looks at the players and the facilities resonates well with the fans, and glass plays a big role in creating that connection. Glass can be used to create a closeness, both in residential and commercial spaces. Glass walls can divide large spaces, while still preserving their “open” quality. In addition, glass can be decorated according to any color scheme. Glassprimer™ glass paint is specially engineered to create a permanent bond with glass without delaminating, fading or chipping over time. Glassprimer™ glass paint is designed to perform even in tough conditions like direct sunlight and high humidity. It can also be tinted to match the paint palette of any major paint manufacturer. If you’d like to find some glass inspiration for your next project, please visit the rest of our site. If you’d like to purchase Glassprimer™ glass paint, please visit our online store . Napier National Aquarium in Napier, New Zealand is considering a massive expansion. Part of the plan could include a glass elevator that takes visitors below the waterline to observe and explore the sea in a replicated environment. The plan calls for the creation of an 80-foot deep controlled underwater coastline habitat, similar to those surrounding the country. The glass elevator is still in the drawing stages, but it would be part of a broad expansion that would give the aquarium the largest, deepest research-display tanks in the world. The Napier City Council has allocated $50,000 to a feasibility study for the project. The national aquarium is supported by the New Zealand government, but the City of Napier is advancing the expansion proposal. In addition to the glass elevator, the plan calls for glass-covered walkways that waves can wash over, and tours in a glass bottomed boat. The goal is to create a world-class research environment, while maintaining a highly visible and desirable visitor attraction. Some of the proposal’s supporters believe that the upgrades could elevate the profile of the National Aquarium to attract world-renowned oceanographic researchers. The aquarium’s research programs are focused on conservation, and that will not change if the upgrades are adopted and funded. The upgrade to the National Aquarium would be enabled by massive improvements planned for roads and other local infrastructure. The ability to see the workings of the habitat through glass is essential to the Aquarium’s visitor education plans, and to the research goals for the facility. Once the feasibility study has been completed, officials will better know the price tag for their underwater vision. If you’re looking for a little above-ground inspiration for working with glass surfaces, please visit the rest of our site. If you’d like to purchase Glassprimer™ glass paint, please visit our online store . Much has been made of the glass recycling dilemma lately. Some brewers aren’t waiting to find out how the glass recycling story ends. Instead, they’ve joined forces to help ensure that glass recycling continues despite the cost. Bottlers are interested in recycling glass because it costs them less to recycle bottles than it does to make bottles from new materials. Lower energy costs mean lower operating costs. This in turn means better profits and an improved ability to tolerate small changes in the cost of production. The recycled content of some container glass is 95% or more, but that typically doesn’t happen in the United States. About 30% of the container glass in the US actually makes it into the recycling stream. The number could be higher, but many recyclers choose to pulverize the glass and use it for landfill cover instead of truly recycling it. About 20 major companies that use glass packaging have come together to help ensure the stream of recyclable glass. The US Glass Recycling Coalition consists of consumer goods manufacturers, glass manufacturers, waste and recycling operators, and trade organizations like the Glass Packaging Institute. The first priority for the coalition is to create, implement and encourage industry-wide best practices that help improve the amount of container glass that makes it into (and out of) the recycling process. One of the first “best practices” is to sort glass out of the recycling stream immediately, instead of waiting to remove it at the end of the sorting process. Removing the glass immediately saves wear and tear on the sorting equipment, decreases the likelihood of breakage, and increases the amount of recyclable glass that gets forwarded to glass recyclers. The long-term goal of the recycling coalition is to reduce energy consumption and to help avoid material shortages in the future. Glass recycling is part of the growing trend toward using glass. Glass is an exceptionally durable and versatile material for both packaging and decoration. If you’d like some glass inspiration, please visit the rest of our site. If you’d like to purchase Glassprimer™ glass paint, please visit our online store . Architects have always struggled with windows. In ancient buildings, the trick was to make the window big enough to admit light, and not so big that it allowed too much heat (or rain, or snow) to get into the building. Then came glass. Single pane windows were the norm, but it should come as no surprise that glass is to blame for about 50% of a building’s heat loss, and about 90% of a building’s heat gain. Sadly, the heat loss comes in the winter, and the heat gain arrives in the summer. Double pane windows can help resist changes in internal temperature, but they’re plagued with their own set of problems. Window frames warp over time, opening large gaps around the window. Seals between glass break, causing the insulating gas to escape. Once this happens, moisture accumulates between the panes, and the insulating value of double pane windows is lost. Controlling the transfer of heat between the exterior and the interior is essential in today’s construction. High quality replacement windows can reduce energy consumption by close to 30%, so there’s definitely an advantage to gaining energy efficiency. The next evolution of construction glass is likely to be “smart glass.” Smart glass is also called tunable glass, because nanoparticles embedded in the glass can orient themselves when a small electrical current is applied. The current causes the window to become opaque virtually instantly, and allows better control of both light transmission and heat gain or loss. If window replacement isn’t part of your plan, you can still employ strategic heat and light control by using Glassprimer™ glass paint. Glassprimer™ glass paint provides coverage for about $1 per square foot, and comes in virtually any color. Glassprimer™ glass paint can still permit light transmission, while providing exceptional UV resistance. Is This The Perfect Wine Glass? Last month, we featured the “perfect” beer glass – a glass with a built-in channel to help produce the perfect aroma and head. Today, we present the perfect wine glass. In the case of this glass, “perfect” may be synonymous with spill-proof. SuperDuperStudio, a design studio in San Francisco, used traditional Italian and Scandinavian glass blowing techniques to arrive at what it calls The Saturn Wine Glass. The glass is handmade, and is hand-shaped in its molten state before it’s blown into its final form with the help of a mold. After molding, the glass is annealed overnight, which allows the glass to cool slowly to relieve stress. This also helps it keep its shape and toughens the finished product. Finally, the perfect wine glass is cut and polished. If you’ve ever tried to clean up a wine stain, you may have a better appreciation for the perfection of the Saturn Wine Glass. Now, what’s “perfect” for white wine may not be perfect for red wine. Fortunately, the designers at SuperDuperStudio have created two different glasses – one for each kind of wine. In case you’re wondering what the difference between a red and white wine glass is, consider this. Red wine glasses are typically taller and wider than white wine glasses are. The reason has to do with the wine. Red wine is more complex than white wine, and requires a roomier glass to allow the flavors and aromas to blend perfectly. In either case, the Saturn Wine Glass won’t let you spill either variety. The glasses are stackable, which allows them to sit more compactly in cupboards and on bar shelves. They’re lead-free, but don’t put them in your dishwasher. Instead, give them the hand-washing treatment and they’ll be yours for a lifetime. You can find more information about The Saturn Wine Glass here. If you’re looking for more glass inspiration, please visit the rest of our website. If you’d like to purchase Glassprimer™ glass paint, please visit our online store .